The first X Factor suicide? Dear. Lord. Apparently, after getting four no’s from the judges, the woman in her 50s ran out screaming she was going to ‘kill herself’. Producers were reportedly still with the woman an hour and a half after she made the threat, making sure she was ok.
Now don’t get me wrong, but I didn’t realise something like the X Factor could cause someone that much stress! I know you get your regular sob stories, and I’m not afraid to admit I get sucked in by them too – in fact, I love them. Even more worryingly, after the SuBo fiasco, this is the first year that the show’s producers have decided to have a doctor at the auditions, ‘just in case’. I can see that shows like this are ‘make or break’ for someone, if it’s their dream. But suicide – seriously?? Have you ever thought about pulling off the perfect heist? Of course, there’s always the pesky police to worry about… but what if they refused to get involved? What if you could steal a million pounds with no risk of being caught? Step up the latest trend in online crime. This time the victims are players of increasingly popular MMPORGs like World of Warcraft and Everquest. More and more Trojans are now being developed to steal players’ account passwords, so that thieves can get their hands on high-level characters and equipment. These can then be sold through online auction sites for large sums of money – reportedly some players will pay up to $1000 for a good character. Wash, rinse and repeat a few hundred times and you have a lot of money indeed. I read a deeply disturbing story today – about a new mobile phone for 4 year olds. The Firefly handset has five buttons: an ‘on’ and ‘off’ button, two ‘call’ buttons – one with a picture of a woman, and one with a picture of a man which will represent ‘Mummy’ and ‘Daddy’ and finally an address book button. It looks pretty much like a toy, so will appeal to the 4 year old market (if they even truly know what they want) – but the truth remains that it’s not actually a toy. It’s a real, working, mobile phone. I find the whole thing quite bizarre, but I think the thing that worried me more was: When would you ever leave a 4 year old on its own!? Surely children of that age are always in protective care? Be it from their parents, their nurseries or schools – 24 hours a day. Luckily, the phone’s makers, an Irish couple, say that you can’t send photos or texts from it, although one handset can receive photos….hmm. All in all, whilst I’m all for embracing modern technology, rolling with the times etc, I think 4 years old is just that little bit too early. In fact, WAY too early. Somewhere in the windswept wilds of New Mexico, construction has quietly begun on the world’s first official spaceport. The name of the spaceport is perhaps a little too reminiscent of Team America – they’ve decided to go with the somewhat kitsch ‘Spaceport America’. &^$* yeah! The spaceport is being constructed for commercial flights – with Virgin Galactic being one of the main customers. Hmm, Virgin Atlantic, Virgin Galactic… when they (inevitably) start flying tourists to the moon presumably they will be called Virgin Lunatic? Back off Richard, that one’s mine. The facility has a 10,000 ft runway, is projected to cost $200 million and should be finished in 18 months time. Then, if you have the cash, a sub-orbital flight and six minutes of weightlessness can be yours. I just read a post on Twitter that’s linking to a diagram depicting online journalism as it was 10 years ago, and how it is today. How online journalism looks today..
My question is this however – does its current layout dampen our enthusiasm for what we’re reading? I suggest that the content of the articles is just as stimulating, but perhaps some people find it harder to access, due to the amount of ads being placed around said article. Furthermore, the comments box isn’t always a bad thing. Sometimes, readers have pertinent things to say on a subject, especially if they have an interest in the topic being covered. Of course you get the occasional idiotic comment – but that’s what moderators are for, they can simply delete any irrelevant comments. Finally, the recommendation box telling readers to ‘share the story’ – via Facebook, Digg etc, is, I would argue, a way of increasing awareness of a story by sharing it with those who would be most interested. Sure, it may be cluttered, but as intelligent human beings who are choosing to read the story in the first place, we’re quite capable enough of picking out the salient facts on a page. If you’re anything like me, the phrase ‘I’m sorry your card’s been declined’ is something you’re unfortunately all too familiar with. You know you don’t have the money, but think, what the heck, I’ll try my card anyway. Cue embarrassment – feigned or real – when it’s rejected. However imagine if your card was declined, and you didn’t have a clue why. Enter in a hoard of angry Barclays customers, when the bank’s internal computers suffered a ‘technical fault’ last week. It resulted in cash machines refusing to issue money to customers, cards being declined at till points, and online transactions failing to complete. mobile payments, which got me thinking. Mobile payments sound like a bloody good idea. And yes, before you rave on saying ‘that’s been mooted for ages’, or ‘how behind the times are you’ well yes I do know about them, but I’ve never really considered them a viable option. It would be a handy alternative, like that secret credit card you’ve hidden in your purse or wallet that you use ‘only in emergencies’ (and those shoes that cost too much but you have to have them don’t count). The money would come out of your phone bill, which normally comes out at the end of the month, meaning you could save up in order to pay it off at the time. Nifty! Let’s take a moment to feel sorry for the guy quoted in the article that was off to buy himself a Ferrari, only to find his card rejected at the garage. FAIL. 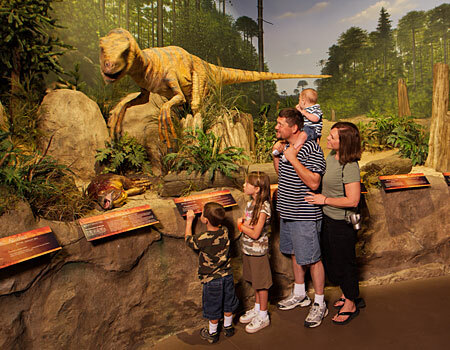 Around two years ago a vast Creation Museum opened in Petersburg, Kentucky. By all accounts a quick wander around the grounds has more in common with a theme park than a traditional museum. Weighing in at almost twice the size of our Natural History Museum, the grounds boast animatronic dinosaurs, a special effects cinema, a planetarium and a petting zoo. All in all the museum cost no less than £17m to construct. But it’s interesting to note that this deliberately “non-scientific” museum makes use of a huge array of technologies that science has created in order to attempt to validate its points. Electricity, robotics, photography, telecommunications and many more all play a part in making this museum seem plausible. This answer from Answers in Genesis. And with SEO like that, how could they be wrong?